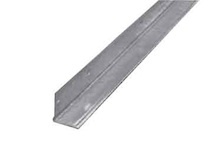 Angle-type trim provides finished appearance for wallboard edges at door and window openings, easy installation, hemmed edge adds rigidity and keeps bead straight, knurle, perforated flange aids cement adhesion, for use with 1/2″ drywall. 50 per carton, 3,000 per pallet. 80 per carton, 3,840 per pallet.